I'm totally hooked on wearing maxi skirts. I always thought I couldn't wear them cause I'm not that tall, but since I bought my first one at Monki a while ago, I really fell in love. I bought two more this week! Oh, I just love shopping the sales. I should promise myself to never shop non-sale anymore. The skirt is a dress from H&M, you might have seen it around. I liked it so much except for the ruffles on the shoulders so I took those off. Now I can wear it under sweaters and cardigans. P.S. excuse the hat being in every single outfit recently. It's the best accessory in rainy Amsterdam. je vintage hat is echt zo zo zo geweldig! ik vind het zeker niet erg dat het in bijna elke outfit post voorkomt :) en je sweater is ook zo leuk! thank u for stopping by, your blog is adorable!!!!! and i agree with u, i thought id never where them either but i now have 3 maxi skirts and 4 maxi dresses lol they are just so easy to wear. I bought a long skirt at H&M but finally brought it back, I love them but can't seem to actually wear them! It is still very inspiring and tempting when I see someone with one. And your look definitely is motivating to have another try! OH I nearly bought that dress but I didn't think I'd wear it. I loved the ruffles but taking them off definitely makes it more wearable. Oh I want it now! Damn. @Ismay They're really easy to take off if you do it carefully. I just thought it made it look like a party dress and I wanted it to be more casual. Here it's still in stores everywhere for 15€; nothing! I even got it for 10€ cause they tagged it wrong! gah! i almost bought that sweater a few months ago and now i am full of regret. i am in love with this outfit. long skirts suit you! I am obsessed with maxi skirts, too! I cannot seem to stop wanting to buy one every time I come across a new one. You look amazing in them, and love the way you style them with pretty sweaters! I need to try this more, once the weather starts cooling off. It's so warm today where I am it, I am in just a sheer dress and sandals! I am so inspired by you! @Dylana, thanks so much, you're so lovely! @Vicky: Unfortunately maxi skirts aren't for everyone but it also takes some getting used to; I'm not that tall (1.66cm) but I think they look okay anyway as long as I wear heels! I love that sweater. Absolutely gorgeous and perfect for cold weather. The hat, I'm jealous. Wow. This is beautiful! You look super tall and lovely. The hat is the perfect finishing touch. Beautiful!! 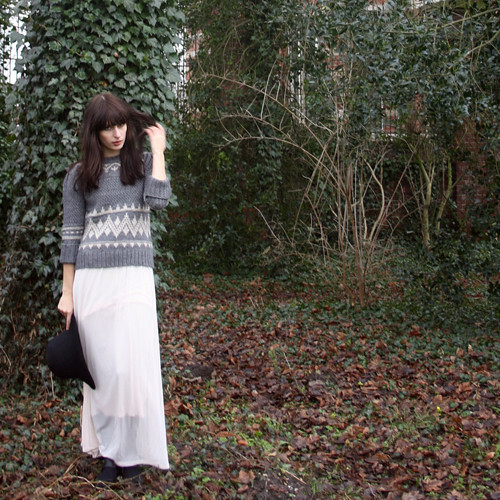 I love the floaty, ethereal skirt with the cozy winter jumper. Yup, non-sale shopping is a foreign concept to me. It's so fun treasure hunting and simultaneously saving money! Love this look on you! Beautiful pieces. I still can't even bring myself to *consider* a maxi skirt, probably because I went to a private school where skirts where required on Wednesday, and they had to be long. I've never recovered. lol. I've never given the maxi skirt a try, but maybe I'll have to be kind enough to try again. I, too, also love a good H&M find and some of their simplistic pieces are perfect for ensembles! i think they're so pretttyy but im too short so i'll look craazy weird in them! Though I'm trying not to buy more clothes recently - it's a hard task! Love this look of yours, it's so stunning! The sweater is really cute! lovely outfit as always laura... love ur style! 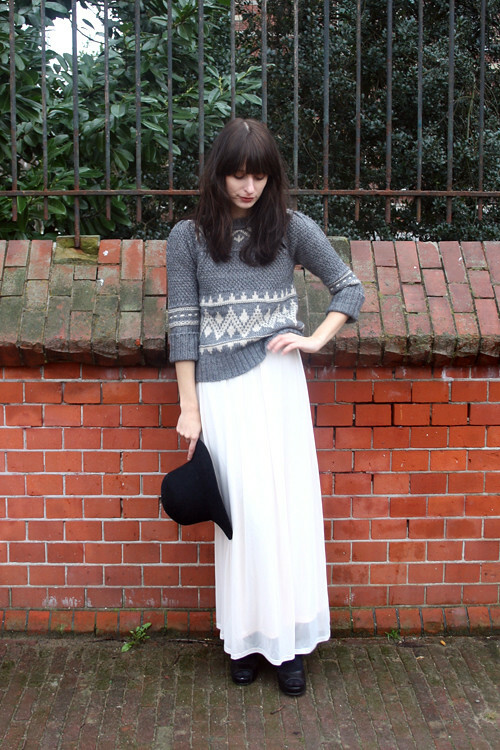 I totally love your maxi skirt...your blog is lovely! The hat is amazing no need for an excuse!! love this look and your whole blog! You look so stunning in these photographs! I love where you took these photos. The brick wall looks amazing in these photos. Also great sweater. I'm so drawn to grey sweaters. I find them so lovely in an understated way. gorgeous outfit <3 you look great in maxis! 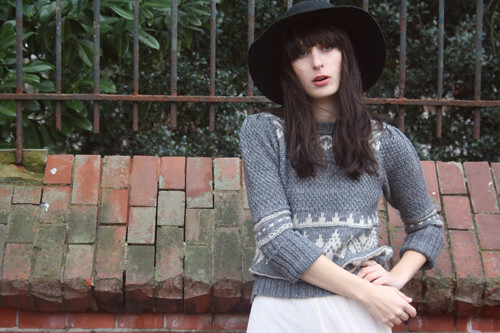 just stumbled upon your blog, & so glad i did :) looking forward to your future outfit posts! stunning. I love a cozy sweater paired with a chic maxi. oh i'm not that tall too! You are making me want to try more of the maxis! I only have 2 so far! I haven't posted photos of the other one but you gave pretty much reason to think that i can also pull it off! thanks a lot! you look awesome!! Just discovered your blog through Chictopia and I'm glad I did, as you definitely have an amazing style! wauw beautiful look! i love the sweater and the maxi skirt. I feel the same way as you felt toward maxi skirt.. I don't tall enough to wear it..
but, looking you wear maxi skirt.. I'm consider to buy one..
Ahhh I am in love with this outfit!! That skirt is so dreamy. Je blog groeit wel heel erg snel, keep up the good work! this outfit is darling. love the sweater. I love the oufit the sweater is so cute. ah i do love your black hat, so cute! Really love this. I have a hat like that in purple but I want one in beige and one in black and one in navy blue, too! Lovely photos. Absolutely beautiful and classic. Yehhh, love it too. Maxi skirt are amazing, really comfortable!!! Perfect combo! This is such a great look.